The Government has been actively supporting sports development in Hong Kong by allocating the required resources with a view to maintaining Hong Kong as a centre for major international sports events, supporting elite sports and promoting sports in the community. In recent years, the sports sector in Hong Kong has reaped great harvests. Not only have our athletes displayed outstanding performance and achieved high-flying results in international sports events, but our community has also developed an ever-growing sports culture, which I am very delighted to see. As Asia’s sports events capital, Hong Kong attaches great importance to hosting major international sports events in the city. The Government has allocated $500 million for a new Major Sports Events Matching Grant Scheme to encourage the private or business sector to sponsor large-scale sports events, thereby providing our athletes with more opportunities to compete in high-level competitions on home ground. Moreover, enhancement measures are implemented under the “M” Mark System Scheme to provide continuous support for national sports associations (NSAs) to host major sports events. In order to further promote sports in the community, the Government will allocate $100 million to the District Sports Programmes Funding Scheme, which will commence this year to support district sports associations in organising more sports events and encouraging public participation. To provide continuous support for our athletes to achieve better results in international sporting events, the Government will inject $6 billion into the Elite Athletes Development Fund to enhance the support for elite athletes, such as reinforcing the coaching team and training partner arrangements and enhancing scientific and medical support. As regards the Kai Tak Sports Park, some latest developments are worth highlighting. Following the award of contract for the design, construction and operation of the Park in late 2018 (in December), the construction works are scheduled to commence in the first quarter of this year for completion by 2023. Upon completion, the Park will provide high-quality sports facilities to support and promote the future development of sports in Hong Kong. Occupying an area of around 28 hectares, the Kai Tak Sports Park will comprise a Main Stadium with a spectator capacity of 50 000. When completed, the Park will become the largest sports venue in Hong Kong. It will be a sports park for all Hong Kong people regardless of age, gender or ability. Hong Kong has excellent athletes whose dedication and resolve have brought positive influence to society. Among them, athletes with disabilities (AWDs) are equally outstanding in their performance when compared with other athletes. 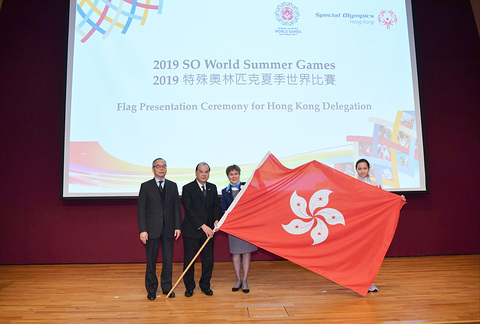 In my capacity as the Acting Chief Executive, I attended the Flag Presentation Ceremony for Hong Kong Delegation of the 2019 Special Olympics World Summer Games last week. I was there to give the delegation a pep talk before they set off for Abu Dhabi of the United Arab Emirates next month (March). I wished them continued success in winning the competitions and bringing glory to Hong Kong. It is expected that there will be over 7 000 athletes with intellectual disability from 170 countries and regions taking part in the Summer Games this year. 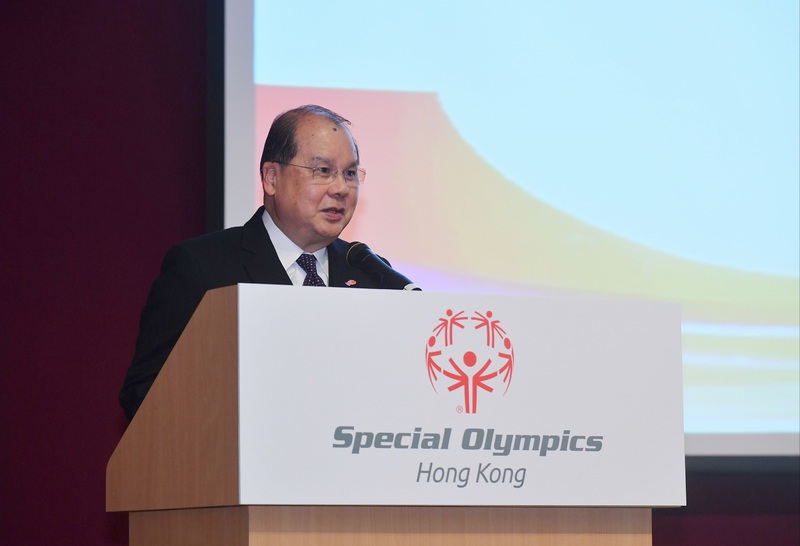 Special Olympics Hong Kong (SOHK) will send a delegation of 103 people, comprising 62 athletes, 21 coaches and 20 medical and supporting staff, to compete in 10 sports. Over the years, our athletes with intellectual disability have achieved impressive results in a number of large-scale international competitions. They have already won 615 medals since 1995 when SOHK first sent athletes to participate in the Summer Games. They have indeed lived up to our expectations. It is also worth mentioning that our athletes won a record high of 5 gold, 3 silver and 2 bronze medals in the Asian Para Games held in Jakarta, Indonesia in October last year. Their remarkable results were really encouraging and admirable. The brilliant results in international competitions achieved by AWDs in recent years are evident to all. The Government has always encouraged citizens of all ages and abilities to engage in sports and strongly supported the development of disabled sports through policy implementation and resource allocation. This approach is in line with the Government’s objective of building a caring and inclusive society. To support the participation of disabled people in sports events, the Government has allocated additional resources in recent years. Regarding the support for the disabled in sports development, the estimated expenditure for 2018-19 amounted to $70 million, representing an increase of over 50% as compared to the previous year. The expenditure was used to provide support for AWDs to prepare for and take part in national and international major sports events, as well as to organise large-scale local sports events for them. The Home Affairs Bureau has been funding the development of disabled sports through the Arts and Sport Development Fund. In the past five years, over $24 million was allocated to sponsor more than 780 AWDs (including those with intellectual disability) to prepare for and participate in major sports events. Under the Paralympians Fund managed by the Social Welfare Department, grants are provided to assist AWDs in different aspects, including grants given to relevant sports associations for hiring coaches, grants for AWDs to participate in training and purchase individual supplies, as well as grants for assisting retired AWDs in their job attachment which enhances their integration into the community. In the past five years, a total of 474 applications for the subsistence grant for AWDs and the employment facilitating grant for retired AWDs (including those with intellectual disability) were approved, involving a total amount of $27.92 million. The provision for the Paralympians Fund and the number of AWDs receiving direct sponsorship in 2018-19 increased by about 10% and 20% respectively as compared to 2014-15. To make our society more inclusive for people with disabilities, we need the efforts of all and cross-sector collaboration among the government, welfare organisations, business sector and all other sectors of the community. For instance, the Law Enforcement Torch Run for Special Olympics (Torch Run) organised annually by SOHK has enlisted the support of over 40 000 participants from law enforcement agencies, special schools and social organisations over the past 30 years. A total amount of $19 million has been raised for athletes with intellectual disability through the running event so far. Originated from the United States more than 30 years ago, the Torch Run has gained popularity all over the world. In Hong Kong, all our disciplinary departments have been participating in this charity event to show their support, which is a fact that makes us proud. 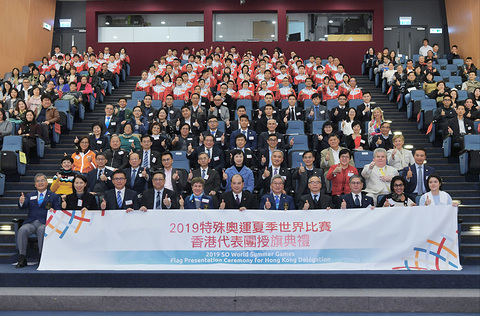 The participating departments include Hong Kong Police Force, Correctional Services Department, Hong Kong Customs and Excise Department, Fire Services Department, Government Flying Service, Immigration Department, Independent Commission Against Corruption, and Leisure and Cultural Services Department. The funds raised are used in organising sports training and supporting athletes to take part in both local and international competitions. The Government will continue to promote the development of disabled sports through outreach programmes and other facilitating measures, with a view to encouraging the disabled to participate in sports. We will closely cooperate with the sports and other related sectors and provide resources in supporting the continuous development of disabled sports.